The highlight of our trip was a backpacking trip along the spectacular Na Pali Coast. 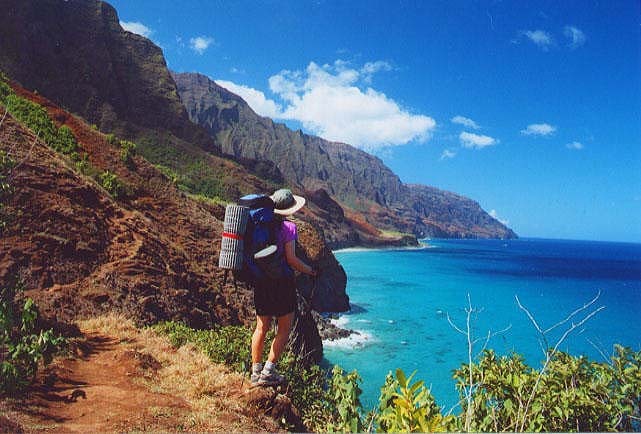 The hiking trail was originally built 800 years ago by the ancient Hawaiians to reach the remote Kalalau Valley where a large settlement once existed. Now the coast is wild and quiet with the exception of the occasional tourist helicopter or boat. 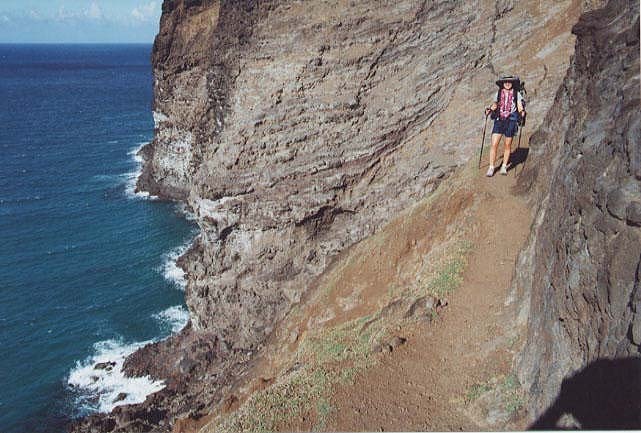 The trail stretches for 11 miles to Kalalau Beach and crosses many valleys in route. It ranges in altitude from sea level up to about 800 ft. 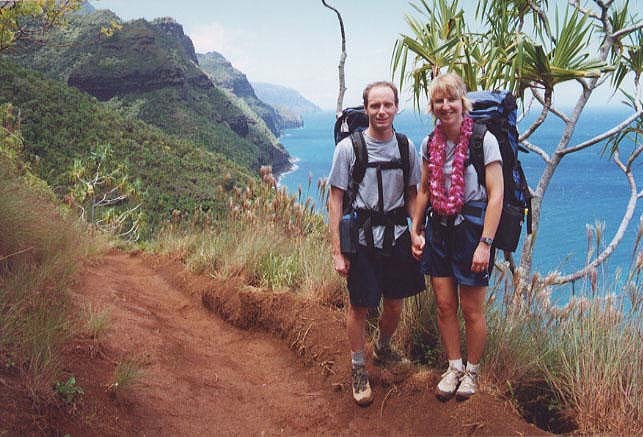 The first part of the trail is on the wet windward side of the island but you make it all the way to the drier leeward side of the island. The change in vegetation was amazing. This was a very tough trail since it climbed and descended repeatedly for a long 8 hour day. The views were incredible the whole way!!! This is near the beginning of the trail. 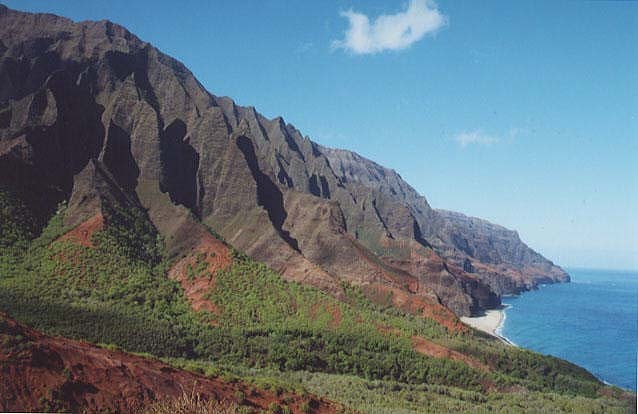 Notice the red dirt which makes up alot of Kaua'i. Boy does that stuff stain! There are many treacherous spots along the trail. This one in particular is scary since it drops 200 ft straight into the ocean. 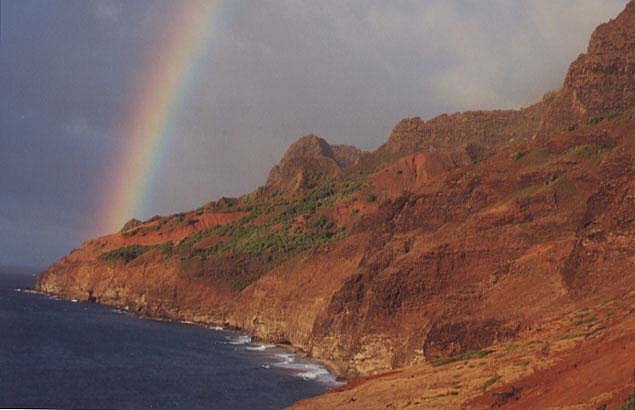 We were rewarded at the end of a long day with a great rainbow as the sun set. View from Kalalau Beach. We camped the first night in the trees in the back of the photo. A nice water fall is on the right. 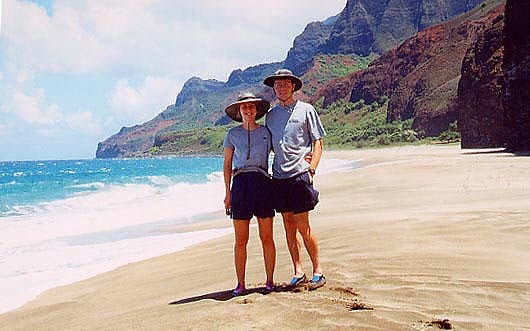 Kalalau Beach is absolutely beautiful! The second night we camped right next to the beach. 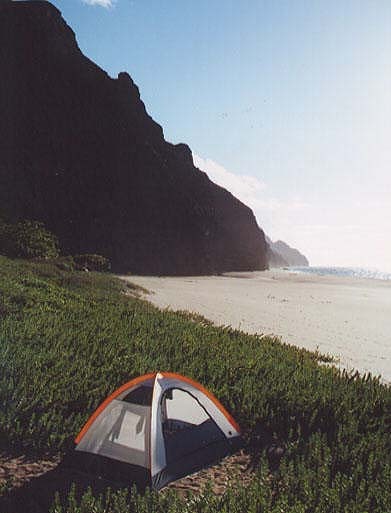 This was one of the best campsites we've ever had. This is on our hike out. 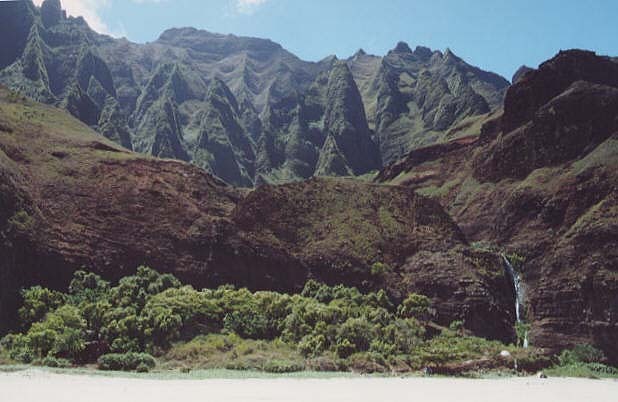 Looking back at Kalalau Beach at the massive fluted peaks behind it. An awesome view along the trail!